Blog » Humber Street Gallery Free Children’s Events! 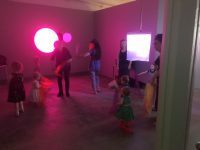 Humber Street Gallery Free Children’s Events! Humber Street Gallery is a really family friendly gallery and café on Humber Street, on the new Fruit Market area in Hull. Although that area is now lovely and looks very smart, there seemed to be a lot of grown-up things to do, such as the galleries and bars. 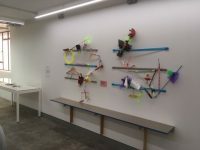 Up to now I’ve not found that much to do along there with my children, however Humber Street Gallery have become a hub for children’s activities in that area and we’ve really enjoyed going to their recent events. As you walk into the main entrance the first thing you come to is a lovely cafe, my kids loved their smoothies. At the back of the ground floor is a large space which hold temporary exhibitions, the latest is all about playing and my children loved turning on lights and seeing colours appear as if by magic. In this space they also have special guests, at the event we went to were Culture Tots music classes and My Baby Can Dance movement classes for tots, at future events there will be others too. Upstairs is the big surprise (I have been in this gallery before and didn’t even know there was an upstairs!). The first floor has an interactive exhibition, still on the theme of play, including seeing if you can balance a chair on one leg! There is an arts and crafts area to make your own piece of art through play which you can then put on the wall. My kids spent ages doing this and were really please to be ‘proper artists’ by having their art on the wall. 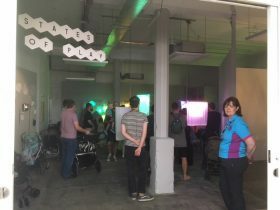 On the second floor is another exhibition with interactive pieces for children to try and volunteers to help with, including a robot they can control! There’s a lift to get prams and buggys up to these other floors. The final floor is the roof terrace which looked amazing if we get to come back without kids one evening! They’re holding special children’s sessions across the summer, Free Play Fridays, bi-monthly from 10am to 12noon where you can just drop in and play for free. 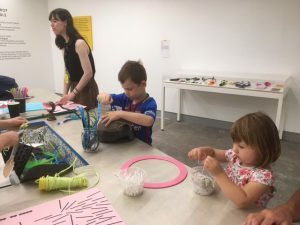 Running on the 21st July, 4th and 18th August and 1st and 15th September, there will be different special guests at each session and arts and crafts in the upstairs gallery. Check the Mumbler Events Calendar for details of each session. Deuce, the gallery opposite, also have States of Play, free craft workshops for all the family on 2nd, 16th and 23rd August. Run by The Crafts Council and using the latest technology, families can make their own innovative pieces of craft. Suitable for anybody aged 5+, just turn up and drop in. So head on down to Humber Street and get some culture this summer! You’ll probably see me there, we seem to be down there most weekends at the moment for an event or activity and we will always be making a stop in Humber Street Gallery! Find out more about the gallery on their website here.